Acorn has two erasing tools: Eraser (E) and Instant Alpha (E). Toggle keyboard shortcut 'E' to switch between the two tools. The eraser and instant alpha are used for removing pixels from a bitmap image. The eraser tool can be changed in size, softness, and flow in the inspector palette. The softness setting allows you to modify the softness and hardness of the edges of the eraser. The flow percentage changes how much is erased with each stroke of the eraser brush. 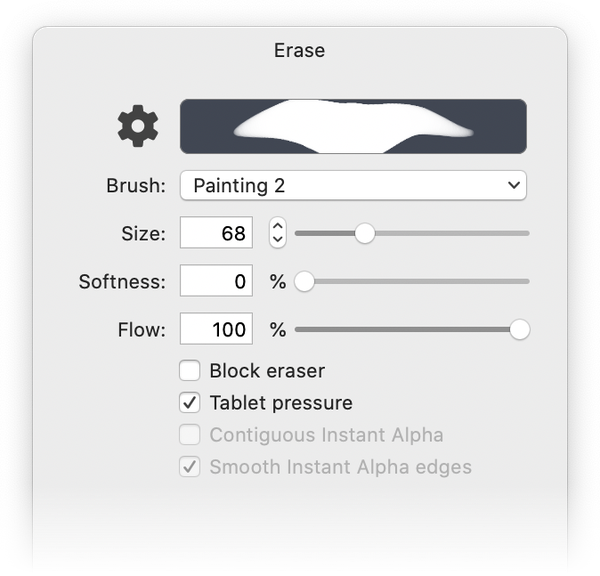 There is also the option to have a "block eraser" which is especially useful when erasing single pixels. If you click on the brush drop down menu, you can select different types of preset brushes, all of which can be used to erase. You can select from brushes, pens, pencils, and more. You can also design your own eraser brush in the brush designer. To open the brush designer, click on the cogwheel icon to the left of the brush preview window in the inspector palette. Instant alpha is an erasing tool that has similar qualities to the magic wand selection tool. Click on the color you want erased and simultaneously drag outwards to increase the erasing tolerance, or inwards to decrease. Instant Alpha is great for removing backgrounds or unwanted pixels in your images. There are checkbox options in the inspector palette for contiguous erasing, and for smooth edges. If you have the "Contiguous Instant Alpha” box checked, you will erase only those same-colored pixels contiguous to the ones you click. If you want to erase all the pixels in the layer that are the same color as the one you clicked, uncheck the "Contiguous" setting. If the “Smooth Edges” box is not checked, then the erasing will have a sharp boundary at its edges. If checked, the instant alpha tool will bleed a little on its edges, for a smoother transition.